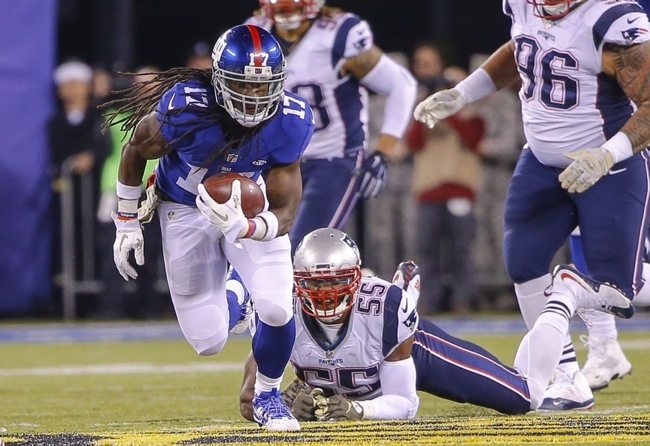 Entering 2016, the New York Giants offensive line was expected to take a major step forward. While the right-side was still composed of journeymen right guard John Jerry and right tackle Marshall Newhouse, the left side and center were composed of two first-round and one second-round draft picks. With all five returning together, greater chemistry and cohesion was expected. And new offensive line coach – the well-respected Mike Solari – was supposed to make an impact. Despite starting 31 regular-season games in his first two seasons, Ereck Flowers has struggled with his technique at left tackle, allowing far too much pass pressure. Flowers was drafted in the 1st round of the 2015 NFL Draft by the Giants. He is huge, strong, powerful lineman who can muscle and maul defenders in the running game. He has the feet, agility, and overall athleticism to be a sound pass protector, but he needs to dramatically improve his pass protection technique. Simply put, Flowers is too inconsistent. Justin Pugh missed five games in the second half of the 2016 season with a knee injury. He started the other 11 games at left guard. Pugh was drafted in the 1st round of the 2013 NFL Draft by the Giants. He was voted to the Pro Football Writers All-Rookie Team after starting all 16 games as rookie at right tackle. Pugh has had injury issues every year since, including missing two games in 2014 with a quadriceps injury and two games in 2015 with an ocular concussion. He was shifted to left guard in 2015. Pugh lacks ideal size and arm length, but he is a good athlete who plays with fine strength, technique, and leverage. Pugh is smart, aggressive, and tenacious. Though not a mauler, he can get movement on his run blocks and he has the agility to do well in pass protection, though he needs to become more consistent in that area. He can pull and block defenders at the second level. Pugh is very versatile, able to play both tackle and guard spots, and probably even center in a pinch. He needs to stay healthy. Weston Richburg started every game at center in 2016. While he played decently, more was expected of him after a strong 2015 campaign. Richburg has started 46 regular-season games in his first three seasons, being drafted in the 2nd round of the 2014 NFL Draft. Richburg is an average-sized center, but he is a good athlete who plays with good leverage and tenacity. Mobile and agile, Richburg, can block at the second level and pull on outside runs. He is smart, tough, and aggressive. 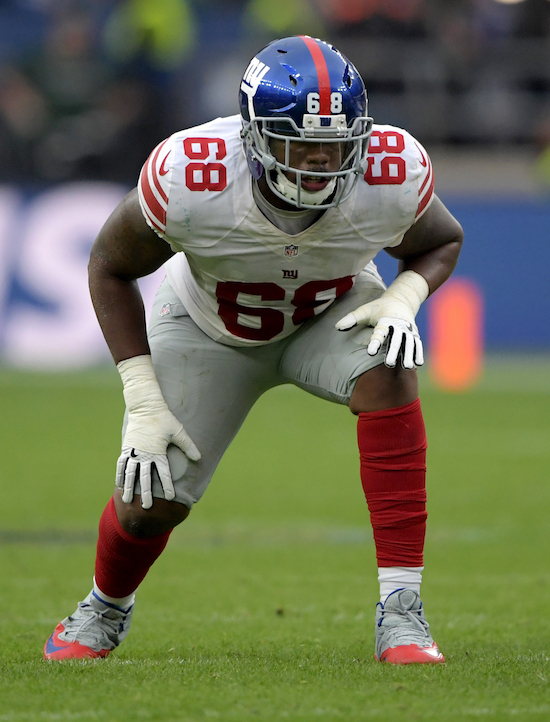 John Jerry started every game at right guard for the Giants in 2016. Jerry was originally drafted in the 3rd round of the 2010 NFL Draft by the Dolphins where he started 45 games in his first four seasons in the NFL. The Giants signed Jerry as an unrestricted free agent in March 2014 and started 16 games in 2014 and eight in 2015. Jerry looks the part as he has great size and long arms. A career inconsistent performer as both a run and pass blocker, Jerry became a far more reliable and steadier player in 2016. Due to an injury Marshall Newhouse, Bobby Hart became the new starter at right tackle in Week 3 until Week 17 when he sat out due a forearm injury. In all, Hart started 13 games at right tackle. Hart was drafted in the 7th round of the 2015 NFL Draft by the Giants. He played in nine games with one start at right tackle as a rookie. Hart is big, strong, and smart, with just enough overall athleticism to play tackle. While he was mostly steady, Hart did have issues in pass protection at times. Marshall Newhouse started the first two games at right tackle, was sidelined by a calf injury for five weeks, started three games at left guard when injuries hit, and then started the final regular-season and post-season game at right tackle. In all, Newhouse played in 10 regular-season games with six starts. Newhouse was originally drafted in the 5th round of the 2010 NFL Draft by the Green Bay Packers. He was the starting left tackle for the Packers in 2011 and 2012 before losing his starting job in 2013. Newhouse signed with the Bengals as a free agent in 2014 but struggled and was benched. The Giants signed him in March 2015 and he started 14 games at right tackle that season. Newhouse looks the part. He’s big and athletic. He’s also versatile, with the ability to play both tackle and guard positions. However, Newhouse is not very powerful or physical and he lacks consistency as both a run and pass blocker. Brett Jones was on the active roster for 14 regular-season games in 2016 and made one start at left guard, but left the game very early with an injury. Jones was originally drafted by the CFL Calgary Stampeders in 2013 and named the CFL’s “Most Outstanding Rookie” after that season. Jones was also named the CFL’s “Most Outstanding Offensive Lineman” in 2014. 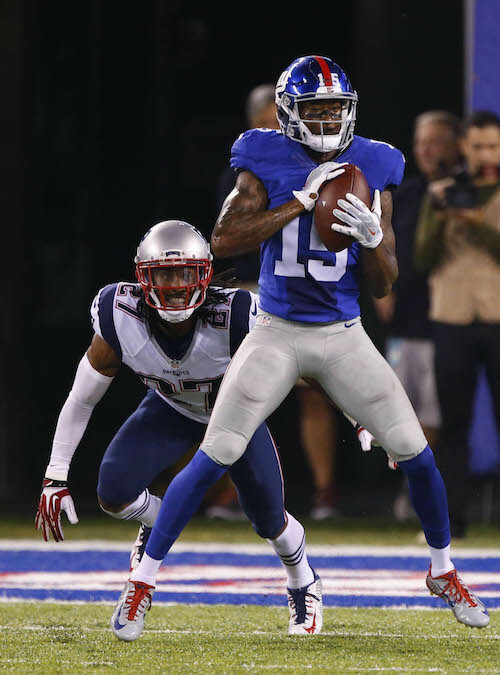 He signed by the Giants in February 2015 and placed on Injured Reserve in September 2015 after spraining the MCL in his knee on the preseason finale. Jones lacks size but he is well built with good overall athleticism. He is a tough, aggressive lineman and very smart. Versatile, he can play both guard and center. Adam Gettis spent the bulk of the 2016 season on the Practice Squad, but he did play in three games with one start at left guard, performing admirably. Gettis was originally drafted in the 5th round of the 2012 NFL Draft by the Washington Redskins. He has spent time with the Redskins (2012-2013), Steelers (2014), Giants (2014-2015), Raiders (2015), and Giants again (2015-2016). Gettis has played in 17 regular-season games with one start. Gettis lacks ideal size and power, but he is an athletic lineman with good mobility. Versatile, he can play both guard and center. 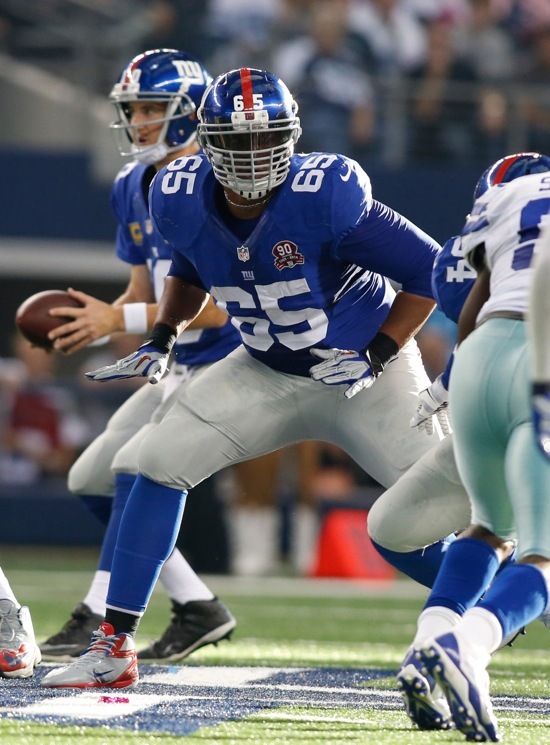 The Giants re-signed Will Beatty in late August 2016 after releasing him in February. However, he was only activated for six games, barely playing with no starts. 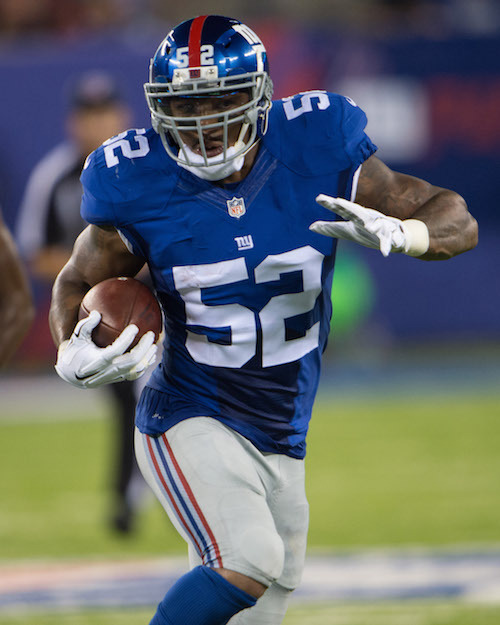 Beatty was originally drafted in the 2nd round of the 2009 NFL Draft by the Giants. From 2011-2014, Beatty started 57 regular-season games. But he has had issues staying healthy, including a broken foot in 2010, a detached retina in 2011, a back injury that caused him to miss offseason work in 2012, a broken leg in 2013, and a pectoral tear and rotator cuff injuries that caused him to miss all of 2015. Beatty is a big lineman with long arms and a very good athlete. When on top of his game, Beatty can mirror and slide with the best pass rushers, and is athletic enough to pull and engage defenders at the second level in the run game. However, Beatty is more of a finesse player. He does not play with a lot of strength and power and he is not a very physical or aggressive blocker. He has not proven to be very consistent or reliable. Jon Halapio was signed to the Practice Squad in September 2016. Halapio was originally drafted in the 6th round of the 2014 NFL Draft by the New England Patriots. He has bounced around different leagues and teams including the Patriots (2014), Boston Brawlers (2014), Denver Broncos (2014–2015), Arizona Cardinals (2015), Brooklyn Bolts (2015), and Patriots (2016) again. He has not played in an NFL regular-season game. Halapio is stout and strong but lacks ideal height and athleticism for tackle and is probably better suited for guard. 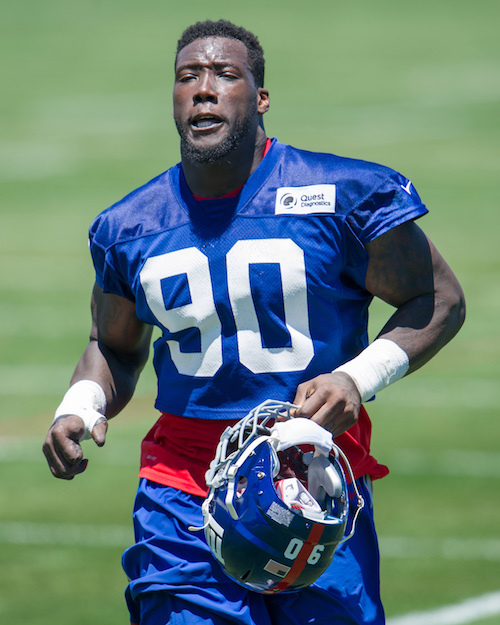 Defensive end Jason Pierre-Paul (shoulder) and defensive tackle Robert Thomas (illness) did not practice on Thursday. “(My shoulder) allowed me to play last Sunday,” said Pierre-Paul. “I’m not even worried about my shoulder. We’re good. I’ll be out there Sunday…maybe.” (The “maybe” was said with a grin). New York Giants fullback Nikita Whitlock has been suspended without pay for the team’s next 10 games for violating the NFL policy on performance-enhancing substances. Whitlock, who is currently on Injured Reserve with a foot injury, will begin serving his suspension immediately. 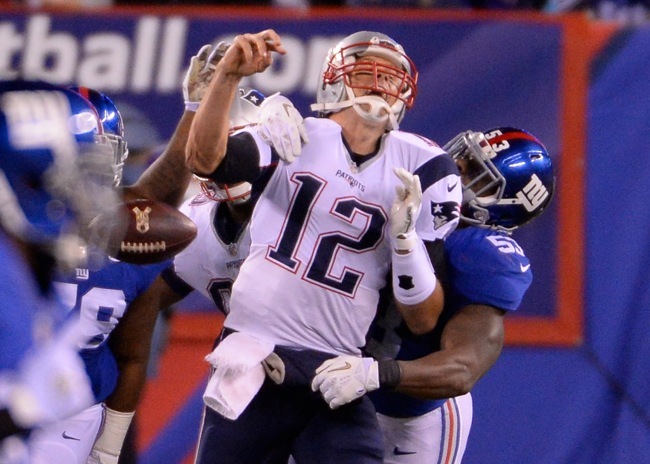 This is Whitlock’s second such infraction. The NFL suspended Whitlock in November 2014 for violating the league’s policy on performance-enhancing drugs when he was with the Dallas Cowboys, who then terminated his Practice Squad contract. Linebacker Jonathan Casillas (ribs) and safety Darian Thompson (shoulder) practiced on a limited basis on Wednesday. Linebacker B.J. Goodson (concussion) and cornerback Leon Hall (concussion) fully practiced. The Giants practice on Thursday at 11:10AM. Although it had been originally announced on March 18th, the re-signing of unrestricted free agent linebacker Jasper Brinkley was made official on Tuesday. Jasper signed a 1-year contract. 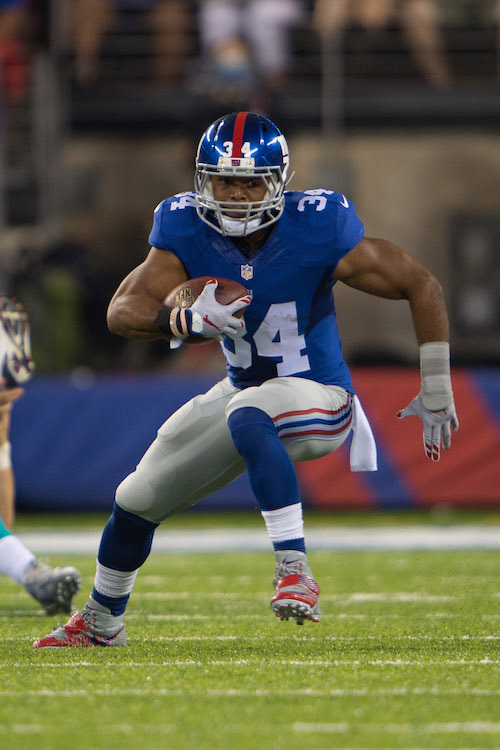 The Giants originally signed Brinkley in September 2015 after he was released by the Dallas Cowboys. He played in 15 games, starting nine at middle linebacker, and finished the season with 67 tackles, 1 sack, and 4 forced fumbles. Brinkley was drafted in the 5th round of the 2009 NFL Draft by the Minnesota Vikings. Since that time, he has spent time with the Vikings (2009-12, 2014), Cardinals (2013), and Cowboys (2015). Brinkley has played in 94 regular-season games with 42 starts. He missed the 2011 season due to hip surgery. “This is where I wanted to be,” Brinkley said. “I had a good season last year. Just given the opportunities I had, and given the guys that are here and the mentality the coaches have, there’s definitely a winning mentality here, and I want to be a part of that. Brinkley noted the Giants’ free agent acquisitions on defense, including defensive end Olivier Vernon, defensive tackle Damon Harrison, and cornerback Janoris Jenkins. Brinkley will have to compete for the starting middle linebacker spot with newcomer Keenan Robinson. The video of an exclusive Giants.com interview with Brinkley is available at the team’s website. 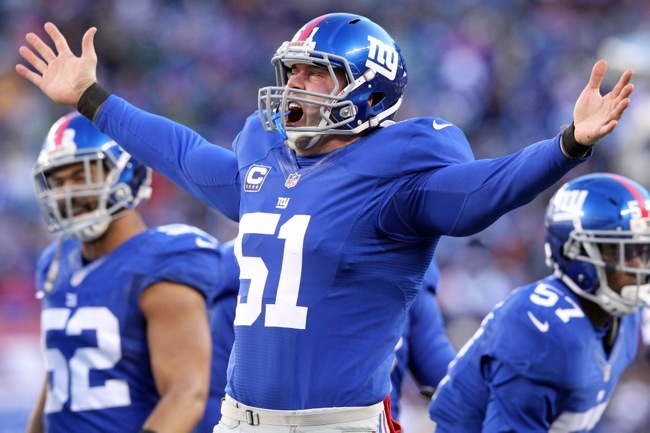 The New York Giants have re-signed long snapper Zak DeOssie, who was set to become an unrestricted free agent in March. The New York Daily News is reporting that it is a 1-year contract. After never missing a game for the first eight years of his NFL career, Zak DeOssie ended up missing the final four regular-season games of 2015 with a wrist injury that required surgery. DeOssie is one of the NFL’s most consistent long snappers, being voted to the Pro Bowl in 2008 and 2010. DeOssie was drafted as a linebacker by the Giants in the 4th round of the 2007 NFL Draft. He is now strictly a special teams player. Aside from his long snapping duties, DeOssie also excels in punt coverage. New York Giants cornerback Prince Amukamara, who is scheduled to be an unrestricted free agent in March, was interviewed on SiriusXM Radio on Wednesday. Amukamara said his agent and the Giants have not yet discussed a new contract and that he expects to hit the open market. “I do hope to be back,” said Amukamara. “I feel like the organization is a great fit for me, and I do feel like they have expressed an interest… From what coach (Head Coach Ben) McAdoo is saying, it looks like they’re going to build a great team. So I’m excited about that. Amukamara was off to a strong start in 2015 until he tore his pectoral muscle in Week 5. He missed the next five games, and when he returned, Amukamara did not play as effectively. He played in 11 games with 10 starts, and finished the season with 63 tackles, 10 pass defenses, 1 interception, and 1 forced fumble. In his five seasons with the team, Amukamara has stayed healthy for a full 16-game schedule just once (2013). He missed most of his rookie season with a broken foot, battled high ankle sprain and hamstring injuries in 2012, and missed half of the 2014 season with a torn biceps muscle. The NFL Network is reporting that offensive tackle was officially released/failed physical as he is still recovering from rotator cuff surgery.